The road to a disengaged team is paved with good intentions. Nobody sets out to make their team overwhelmed, stressed out or miserable. But unfortunately, that often happens when people manage people. As hard as it may be to accept, that horrible boss, manager or owner that you know likely isn’t a bad person. In fact, if you got to know them, I’m sure you’d find them to be a good hearted person who genuinely cares about the well being of others. So how do good people become bad managers? It’s actually something that happens unconsciously. Statistically 7 out of 10 workers either disengaged or actively undermine the efforts of their organization. Yes, you read that right. You’ve probably also read countless articles, blog posts and books filled with tactics to change that. But what you probably haven’t read — and what is shockingly entirely absent from the discussion — is the other side of the relationship: manager / team leader engagement. As a business owner, I use to operate under the assumption that lack of team engagement was the employees fault. When the truth is it’s a 50 / 50 split between the manager and the employees. 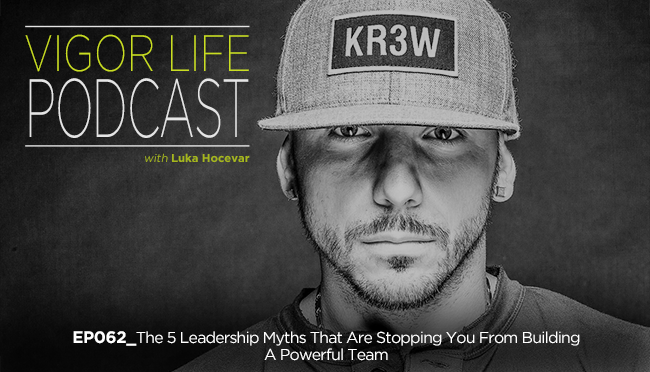 In this episode I share 5 myths that are stopping you from building a powerful team, and how to flip the coin in your favor. This entry was posted in Podcasts and tagged Business, Coaching, Entrepreneurship, Fitness, Fitness Business, Happiness, Personal Development, Self Development, Self Help, Success, VigorLife. Bookmark the permalink.